The beautiful thing about upholstery is the flair and uniqueness that the fabric can bring to any piece. 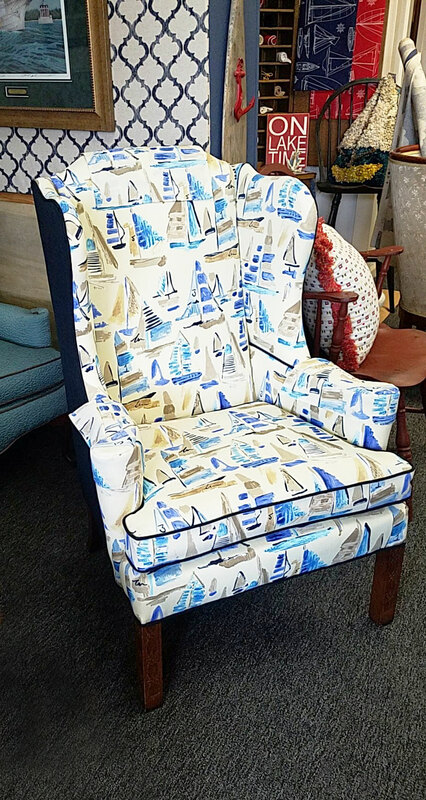 At the Chairmaker and Friends, you'll see upcycled or restored pieces with fresh fabric and new springs, or brand new pieces of furniture, custom designed, built and upholstered down to the last detail. With many upholstered pieces of furniture, replacing the fabric is typically just the beginning. More often than not, when the fabric comes off, more problems surface. At The Chairmaker and Friends, we ensure all repairs are done on the frame, and refinish it when the frame is visible. We also replace the interior portion of the upholstered areas, including padding, foam and wrap. This way, we are able to guarantee each chair for life. Shown above is one of our favorite set of upcycled chairs to date. 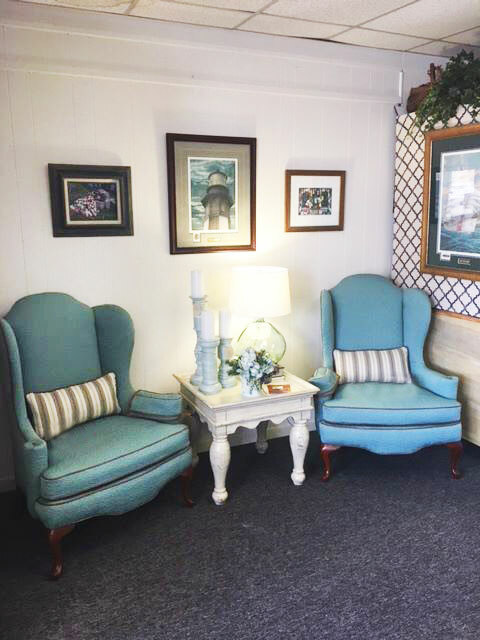 Check out our blog for the full process of repairing, refinishing, and reupholstering these nautical treasures. From traditional to modern, and anywhere in between, we love giving chairs and upholstered pieces a fresh, new look. Both indoors and out, our furniture is guaranteed for life. 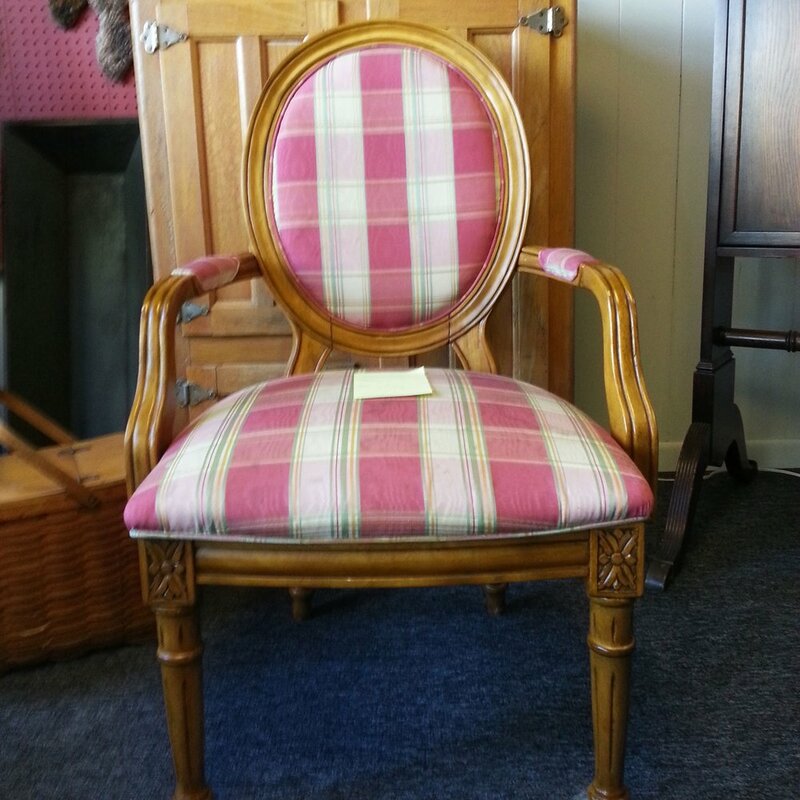 These upholstered pieces are rebuilt top to bottom, and ready for comfort. Fully constructed and upholstered at the Chairmaker and Friends, this set of chairs boasts a botanical fabric on the front and a matching striped fabric on the sides. 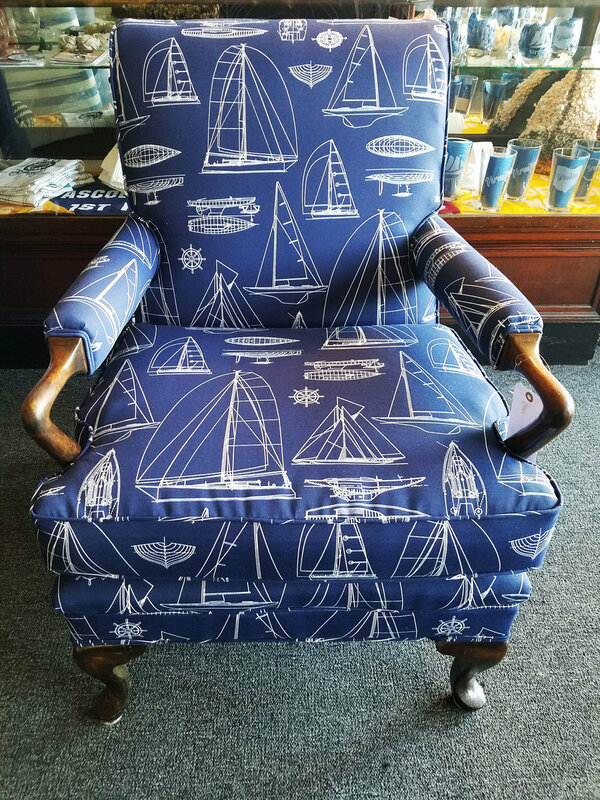 True to the town of Vermilion, this extremely comfortable wingback chair shows off our nautical location. 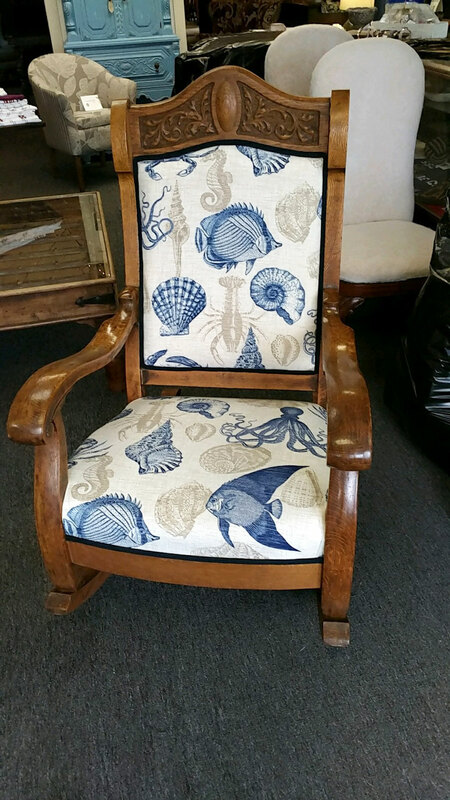 This club chair was refinished and reupholstered in a bold geometric pattern. Truly a unique piece, this chair was reupholstered for a creative client, in a fabric true to the frame’s unique style. 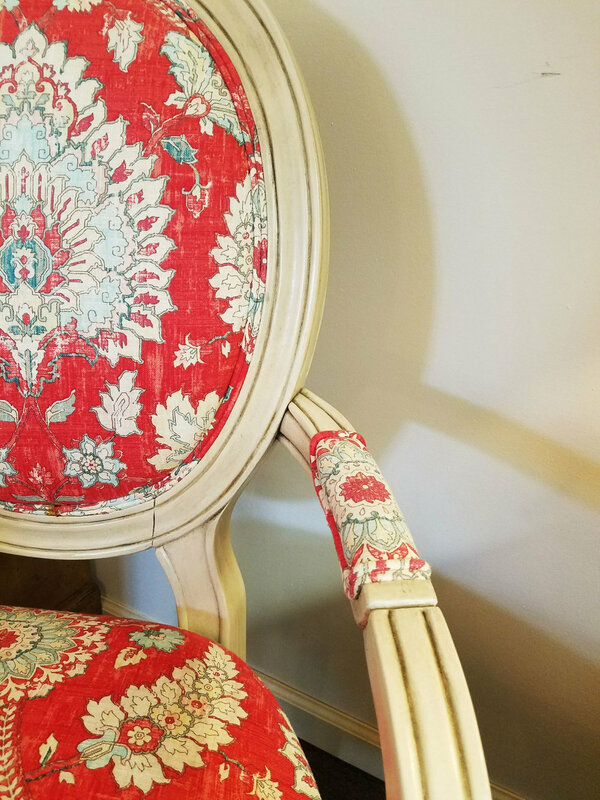 This chair was refinished with white paint and a deep glaze on the frame, and reupholstered with a light but interesting patterned fabric. Part of a set of two, this sun room bench was reupholstered to create a comfortable sitting area and withstand the UV light. This dining set was reupholstered in a plush yet sleek fabric to reflect its original style.